Popcorn is the quintessential American snack. Watching a movie? Kids want a snack? Get hungry at work? But it turns out microwavable popcorn bags pose a threat to our health. 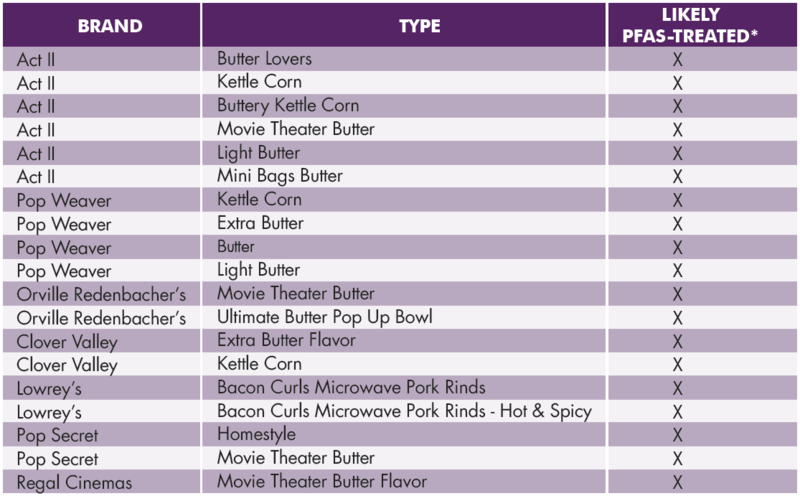 Every microwavable popcorn bag tested by the Center for Environmental Health in 2017 came back positive for fluorine, indicating that they are highly likely to contain harmful nonstick chemicals known as PFASs. If only there were a way to create a nonstick bag without using dangerous PFASs….but there is! The grocery store chain Coop Denmark has phased PFASs out of all its products, and popcorn manufacturers have found a way to make popcorn bags that are safe for human use. For instance, the brand Popz Popcorn sells PFAS-free popcorn bags in Denmark, but PFAS-containing popcorn bags in the U.S. We can have access to healthy popcorn bags in the U.S. by passing the Healthy Food Packaging Act (HB 2658/SB 6396)! Unlike popcorn bags, pizza boxes do not appear to widely contain PFAS chemicals. We tested 19 pizza boxes to determine whether they were likely treated with PFAS chemicals and found only one box was likely treated. This means that manufacturers have found a way to make pizza boxes that prevents pizza grease from soaking through without the use of dangerous PFAS chemicals. As for the pizza box that did contain PFAS chemicals, clearly the use was unnecessary given that other manufacturers have made a similarly functional product with alternatives. * A note on methods: Popcorn bags were purchased by the Center for Environmental Health in California in 2017 and pizza boxes were purchased by Toxic-Free Future in Washington State in 2017. Samples were given to Dr. Graham Peaslee at the University of Notre Dame and analyzed for fluorine using PIGE spectroscopy as an indication of likely PFAS treatment.